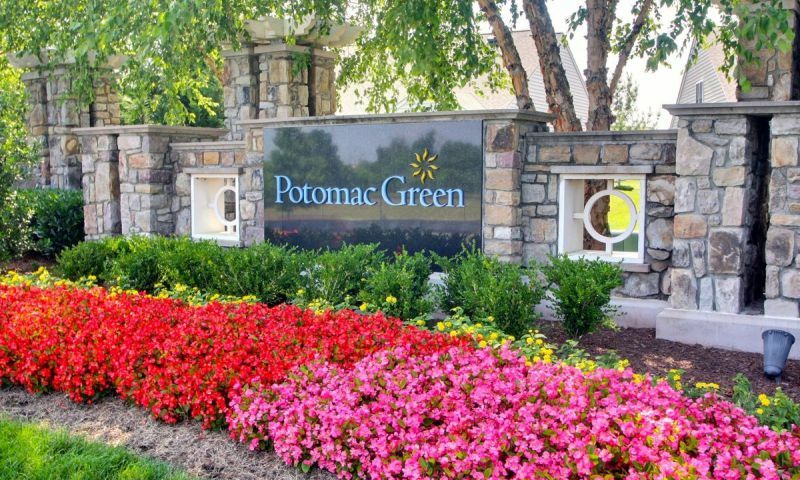 Potomac Green, in Ashburn, Virginia enjoys a prime location within Loudoun County, just off of the Dulles Corridor. This beautiful community welcomes residents aged 55 and better and provides many amenities to support an active adult lifestyle. Potomac Green's award-winning clubhouse features a state-of-the-art fitness center, tennis and bocce ball courts, indoor and outdoor swimming pools, an indoor walking track, hobby and game rooms, a ballroom, and a wellness center. With its close proximity to both Washington D.C. and the scenic beauty of the Blue Ridge Mountains, Potomac Green provides residents easy access to both urban and rural attractions. Shopping, dining, cultural attractions and other businesses are plentiful throughout the surrounding area. The INOVA Loudoun Hospital is less than five miles from Potomac Green, and Dulles International Airport is only 15 minutes away. Amenities are plentiful at Potomac Green, and they are centered on the community's beautifully appointed 29,000 square-foot clubhouse. Here residents have many options to stay active and keep in shape. The state-of-the-art fitness center provides cardiovascular and strength training equipment, as well as an aerobics studio and indoor walking track. Potomac Green also offers both indoor and outdoor swimming pools, tennis and bocce ball courts, and outdoor walking and biking trails. The spacious clubhouse has plenty of meeting and multipurpose spaces, which includes a grand ballroom that is perfect for community events. Hobby, game and craft rooms are also available, as are billiard and card tables. A full-time activities director is on hand to help residents find activities, schedule classes or plan excursions. The large variety of social clubs makes it easy for residents to get to know their neighbors and explore new interests. Local bus service includes a commuter route with connections to locations throughout Washington D.C., as well as daily shuttle services to nearby locations, including shopping centers and medical facilities. Potomac Green is a 55+ active adult community that began as a co-branded between Del Webb and Centex Homes, and then became a Del Webb community after the Pulte-Centex merger in 2010. Del Webb offers construction elevator condos. Homebuyers can select one of these low-maintenance residences that range from 890 to 1,662 square feet in size. Most of Potomac Green's condos have two bedrooms and two bathrooms. Resale single-family homes are available in 12 different floor plans and most include two bedrooms, a den and attached two-car garage. Most models also have an optional or included second-story loft, which adds a third bedroom and bathroom to the home. There are two types of attached villas in Potomac Green including Triplexes and Quads, both are available as resale homes. There are three models to choose from in the Quad Villas that range from 1,919 to 1,973 square feet. Each model includes two levels with a first floor master bedroom. The Triplex Villas were offered in two floor plans including the 1,542 square-foot Burlington or 1,314 square-foot Concord. Each model also has an optional second floor that adds an extra bedroom, bathroom and loft space. The Triplex Villas are available as resale homes only. Residents at Potomac Green enjoy many diverse interests. The plentiful amenities, community events and social clubs give residents many opportunities to get to know their neighbors and explore either new, or long-held interests. A full-time activities director can help residents plan their recreations and social activities. However, residents can take part in as much or as little of the community activities as they wish. Social clubs at Potomac Green cover a wide spectrum of interests, from ballroom dancing to comparative religion. Special interest groups focus on many different games including billiards, poker, Mexican Train, and Rummikub. There are clubs for activities such as tennis, bocce ball, line dancing and book clubs. Nearly every resident is sure to find a club of interest. Set in the sought-after Ashburn area, Potomac Green enjoys a quiet suburban location that is within close proximity to both the Dulles Corridor and the many businesses and services found along Route 7. Washington D.C. is an easy drive, approximately 45 minutes to the east. Along the way, prominent towns such as Reston and Tysons Corner provide fine dining and shopping opportunities. The Dulles Town Center shopping mall is only minutes away, and nearby Leesburg Premium Outlets offers over 110 outlet stores. INOVA Loudoun Hospital's state-of-the-art facility is less than five miles away, just off of Route 7 in Landsdowne. Though Ashburn is a rapidly growing area, residents do not have to go far to enjoy the scenic beauty of Virginia's Hunt Country, where quaint towns like Middleburg offer charming restaurants, Bed and Breakfasts, antique shops, wineries and equestrian centers. The beautiful Blue Ridge Mountains are located about 50 miles west of Potomac Green. Potomac Green's immediate surroundings include many all-age communities and several great golf courses, including: Goose Creek Golf Club, Brambleton, and Westpark golf club. Loudoun County's Parks and Recreation department offers many recreational centers and parks throughout the area. The nearby Wolf Trap Foundation for the Performing Arts provides world-class concerts and performances. Dulles International Airport is only 15 minutes away, and the Smithsonian's Udvar Hazy Air and Space Museum is adjacent to the airport. Del Webb's Potomac Green in Ashburn, Virignia is a wonderful 55+ community that offers a variety of home styles and sizes for today's active adult homebuyer. There are plenty of activities available in Potomac Green. Here is a sample of some of the clubs, activities and classes offered here. Homebuyers can select a low-maintenance home that ranges from 890 to 1,662 square feet in size. Condos have two bedrooms, two bathrooms and assigned parking. The Quad Villas are attached two-story homes arranged in four-plex configurations. They are available as resale homes. There are three models that range from 1,919 to 2,640 square feet. The Regency and Patriot models are available as middle or end-units. The Colonial model is offered only as an end unit. All floor plans include two levels with a first-floor master bedroom and two-car garage. The Triplex Villas are available in two floor plans including the 1,542 square-foot Burlington or 1,312 square-foot Concord. Each model has a one-car garage and an available second floor option that adds an additional bedroom, bathroom and loft space. Each three-unit building contains two Burlington models and one Concord model. The Triplex Villas are available on a resale-only basis. There were eight single-family home models built by Centex in Potomac Green. These exciting floor plans range from 1,662 to 2,650 square feet. Most models include a second floor with extra bedrooms, bathrooms and loft space. Numerous single-family homes have been built throughout Potomac Green. All of the models are offered on a resale-only basis. Most single-family homes by Del Webb offer between 2,152 and 2,919 square feet of living space. These homes generally have two to three bedrooms, two to three bathrooms, and an attached two-car garage. We moved into Potomac Green a year ago and absolutely love it. The community is so well maintained and well run. The clubhouse is amazing with many activities and much to do with an incredible indoor and outdoor pool. The neighborhood is quiet and peaceful particularly at night, no traffic to disturb the tranquility. Our neighbors are very friendly and outgoing. We definitely made the right choice moving into this community. Great neighborhood with an active clubhouse. Homes are pricey, but location is great. Homes and condos are available. Neighbors are friendly. We've lived here in Potomac Green for one month and so far we absolutely love it. It is everything we were hoping for - well maintained community, friendly residents, lots of activities and an awesome clubhouse with pool, workout room, social rooms, etc. Potomac Green is our main residence and we have a second Del Webb home at Stone Creek down in Ocala, FL. We split time to see all our kids more often and enjoy spending the winter months down in Florida. When we're in VA we absolutely love Potomac Green. The clubhouse is fabulous and the people here are very nice. We've had nothing but wonderful experiences in both of our Del Webb communities! 55places.com is not affiliated with the developer(s) or homeowners association of Potomac Green. The information you submit is distributed to a 55places.com Partner Agent, who is a licensed real estate agent. The information regarding Potomac Green has not been verified or approved by the developer or homeowners association. Please verify all information prior to purchasing. 55places.com is not responsible for any errors regarding the information displayed on this website.